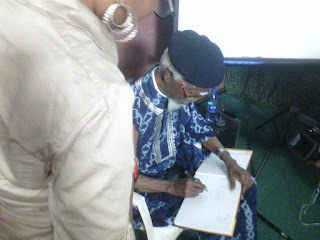 I spent several hours on Saturday in a room with Demas Nwoko. 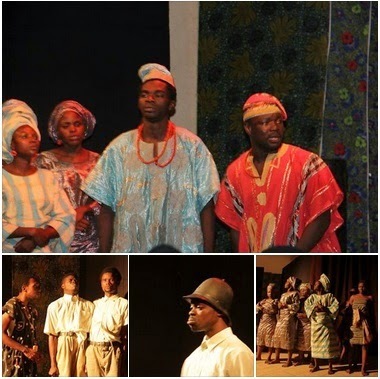 Building on a family heritage as a (home-)builder, training in colonial Nigeria as an architect, formal training as a stage (theater) builder abroad, and also the vibrant post-Independence atmosphere in Nigeria up to FESTAC-77, he did what seemed natural and commonsense to him often. Following these simple rules, he has become known worldwide as THE innovative architect from Nigeria. His life makes a lot of sense to me. The next day, I watched Death and The King's Horseman. PAWS (Performing Arts Workshop Studios) has matured in such a short time to stage such a breath-taking performance. 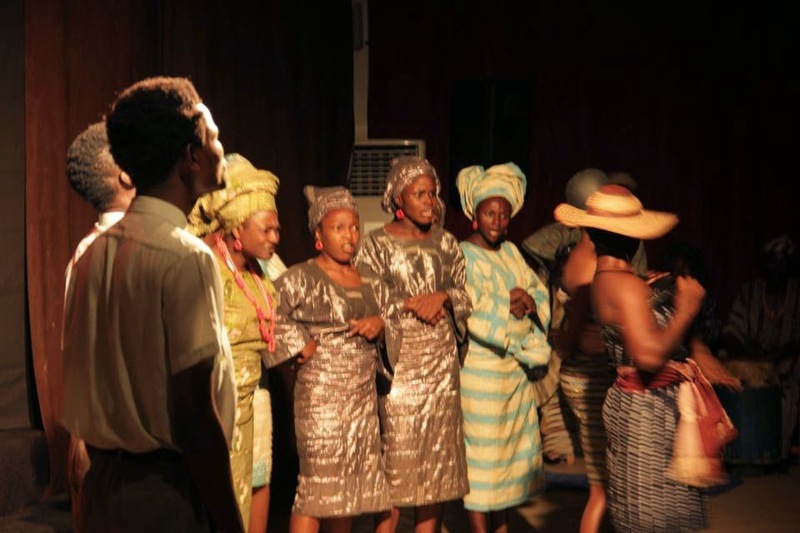 They really should extend the show, but it seems they can't and the last two performances will be Sunday July 29 at 3pm and at 6pm at Terrakulture in Victoria Island, Lagos. I look forward to watching the show again on Sunday and to eating a giant grilled fish on Bar Beach. PAWS has gained so much esteem in my eyes, I will catch their every show from now on. Kenneth's wife is the PAWS manager, it appears. Smart gal. 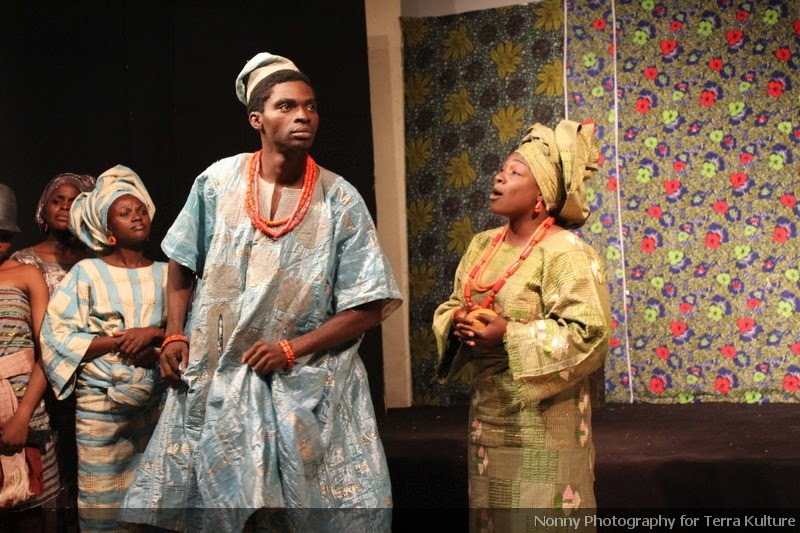 And Renegade theater now shows at the MUSON center...good to know. I just read a notice for this creative workshop, taking place on the campus of University of Lagos. It is special to have such informal learning housed in a Nigerian university on a regular basis. This is exactly the kind of development that Nigerian education needs, and that my friend Ferdinand Adimefe (curator of The Interface Foundation and Conversations) did quite a bit to advance. I hope such meetings spread. I am offering a single scholarship to attend the Harmattan Workshop with renowned Nigerian artist Bruce Onobrakpeya. Email me as applications close on Sunday July 29. If no takers, maybe I'll attend instead? Work on my book covers? 1. I am not over 25 years old. 2. I am currently not able to afford the full cost of attending the Harmattan workshop. 3. Attach a photograph of one of the best artworks or art-related works you have ever done. 5. Name, Address, Phone number, and email. I will select one applicant for whom I will pay the workshop fees only. Besides this payment, I do NOT assume or imply further responsibility for the winner. I will email to notify the winner by Tuesday July 31st. Please only apply if truly eager, willing, and able to study art at the studio of one of the finest talents. Nice. It seems you are having a lot of fun. Have you heard the phrase "renaissance soul" before? From the little I've seen so far, that seems like an apt description of you. I don't think I've seen "death and the king's horseman" before. It has always been one of my favorite plays - though I admit I am not big on plays. Hope to watch a performance one of these days. Renaissance soul, eh? So on the one hand I'm thinking Italy and a portrait of an aristocrat (Medici? ), and then I'm thinking Lauren Hill or Tracey Chapman with a jazz band in black-and-white video. Ooo-kay. Re: Unilag Design Workshop, here's a taste of what Lagbaja unveiled to the audience: his definition of AFRICANO ; African music supplying the BEAT, rhythm, groove; and an app he developed to superimpose groovy African beats on songs/sounds of your choice. Lagbaja.com is a cool resource for Yoruba drum demos and info. Somebody else (named Ibukun Fasunhan) thought Death And The King's Horseman was exceptional, wonderful. He has a detailed write-up with photos here.